GOLF MY WAY is the one book that presents a complete, in-depth, A-to-Z explanation of how this greatest of champions thinks about and plays the game. 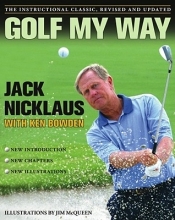 Unlike his other books, which present tips and tweaks, GOLF MY WAY gives the reader Nicklaus's entire approach, allowing the avid student to pick and choose among Jack's principles and techniques. In the thirty years since it first came out, Nicklaus has gone on to compile the greatest championship record in golf history. As is inevitable over any thirty-year span, there have been considerable changes in his body, his equipment, and the golfing scene around him. With his tournament career winding down, Jack felt it was time to put the finishing touches on this instructional classic, adding significant new material that shares what he has learned through the years and how he has coped with the changes in and around him. A whole new section, 'Reflections and Recommendations', discusses what, why, and how the changes in his outlook and techniques came about; it gives advice on the oft-neglected mental elements of playing better that are not directly related to ball-striking or shotmaking (factors that may have been his greatest strengths as a player); and reflects upon the differences in tournament golf now compared to when he joined the PGA Tour. GOLF MY WAY was hailed as a classic as soon as it arrived on the scene. Now Nicklaus closes the books, with the definitive final edition that covers the whole of his game through a lifetime of greatness.